Let’s get the obvious cliché opening out of the way: Pinterest is the hottest new social network on the scene. You’d have to be living under a rock to miss this one. It’s the best thing since… Well, you get the point. From the moment I discovered that membership is by invitation only, I knew I had to get in. I’m not above pleading—or shameless name-dropping—so I e-mailed the lovely folks at Pinterest and the next day an invite landed in my inbox. I’ve been playing around with it for a few hours now, and I have to say I am smitten; so this is the first of many posts in which express my undying love for all things Pinteresting. If you’re anything like me, you spend 10% of your time online looking at things, and the other 90% trying to find those things you saw and forgot to bookmark. Pinterest eliminates the chance of this ever happening again. By adding the ‘Pin It’ button to your quick bookmarks you’ll always be ready, pin in hand, to pull web content from anywhere and stick it on a board. You can then browse other boards, re-pin, or ‘like’ other member’s web finds. I know what you’re thinking, why not just bookmark everything? Because bookmarking is selfish, and does your bookmark folder look as beautiful and inspiring as this? So why is it good for business? It might not have the current user numbers of Facebook or Twitter, but it’s still getting its fair share of ogling. The site is visually appealing; it’s a real feast for the eyes, with a touch of unabashed consumerism thrown into the mix. It’s a place where people (mostly women) can get together and covet pretty things. Any business hoping to crack the pinterest market will have to learn to push more than just their products. They’ll have to promote the whole lifestyle that goes with it; the ‘look’ that their product fits in to. Traffic to the site increased by 429% between September and December 2011. This staggering increase in users, coupled with this referral traffic report from Shareaholic, makes for some pretty exciting reading. 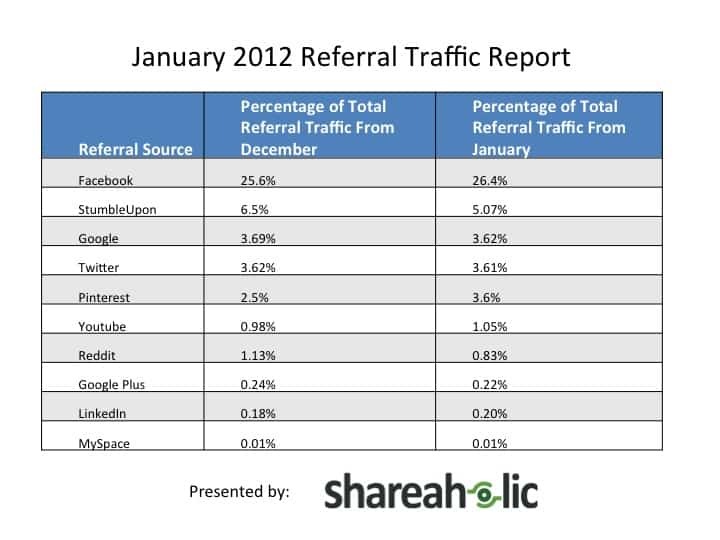 It’s also interesting to note that back in Jul 2011, Pinterest only accounted for 0.17% of the referral traffic. It’s one of those wait and see situations, Will Pinterest be able to take the UK too? And will I ever stop talking about it?